René Louis Becker, born and educated in Strasbourg, France, as the son of a prominent organist, moved to the USA at age 21 in 1904 and taught music, composed prolifically, and worked as an organist in St. Louis, Illinois, and Michigan for 52 years. 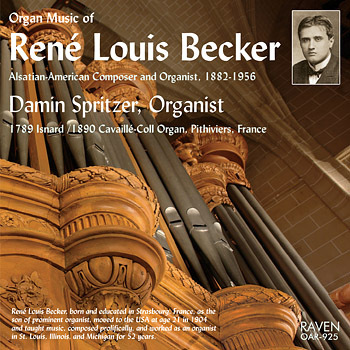 Click here to watch on YouTube: Damin Spritzer at the 1890 Cavaillé-Coll organ play the Finale: Toccata of René Louis Becker's Third Sonata. Video was shot by Christoph Martin Frommen, the esteemed engineer and creator of the superb European CD label, Aeolus, who recorded this program for Raven and achieved superlative results, capturing the large acoustic of this grand organ's environment. Vying for attention here is the first recording of the combined century-spanning Isnard/Cavaillé-Coll since its restoration in 2008 by Bertrand Cattiaux, and first appearances on disc of seven pieces by the all but unknown Alsatian-American composer-organist Rene Louis Becker. Damin Spritzer serves both instrument and music well, alert to the music's lyrical mien and harmonic muscle, negotiating the III/49 machine with an easy command of drama and real feeling for Becker's melody-led, cleanly executed music. The unabashedly romantic Second Sonata, majestic Third Sonata, vivacious Toccata, and soft and tender Supplication reveal Becker as a composer of substance and sophistication. A second volume is eagerly awaited. It is quite surprising that composer and organist René Louis Becker (1882-1956) has been forgotten almost entirely, as his career in America from 1904-1956 spanned a very rich era for the organ world. His stature among contemporaries ranked him for inclusion in the very first volume of The American Organist magazine, in a lengthy biographical article with a full-page photograph. The quality and quantity of his organ music represents a significant contribution to American 20th-century organ repertoire. His compositional style combines European training in Strasbourg with a lifetime spent under the influence of American and European contemporaries, and his musical style is defined by lyric, singing melodies, clean counterpoint, and an appealing harmonic language. Becker’s entire musical estate was consigned to storage with his family after his death in 1956. On my many visits with the family, I counted 529 scores in the collection (further examination may change this number slightly). 152 of those were for solo organ, 54 of which were published during Becker’s lifetime. There are no dates of composition on any organ scores, but copyright dates and opus numbers provide a semblance of order if few insights into his development as a composer. Additional complications arise because of the presence of handwriting from several different individuals throughout the corpus, as well as many instances of duplicated, altered, or even crossed-out opus numbers. The published works, as would be expected, are generally the more refined and polished. The works still in manuscript are quite diverse and often display more experimental or unusual examples of his writing. A consistent trait of Becker’s style is the use of ABA form with dramatically contrasting B sections, and of the 152 known organ works, more than 85 exhibit this form. The most significant of Becker’s previously-published organ compositions are the three multi-movement sonatas, two of which are heard on this recording. They pay homage to the revered tradition and grand style of the romantic organ sonata/symphonie, following in the footsteps of great organist/composers Charles-Marie Widor, Alexandre Guilmant, and Joseph Rheinberger in their form and inspiration. Becker’s smaller works incorporate a wide range of styles from strictly classical to a more modern idiom of what might be called “character pieces” with fancifully evocative titles such as Sur le Nil, At Sunrise,Oiseaux Volants pour Orgue, Idylle Angélique, and Crépuscule à l’Orient (Melodie Arabe). René’s father, Edouard Becker (1838-1895), was a prominent organist from Bischheim, Alsace, who served as the organist for Chartres Cathedral and the Strasbourg Cathedral in the 1860s and 1870s. René was the second-to-last child in the large family, taught first by his father and then formally trained at the Strasbourg Municipal Conservatory of Music from 1896-1904: piano with Ernst Münch and Fritz Blumer (a student of Franz Liszt), harmony with Carl Somborn (a student of Joseph Rheinberger), and organ with Adolph Gessner. In 1904, Becker immigrated to America to join his older brothers Lucien and Camille in St. Louis, Missouri, where they established the Becker Bros. Conservatory of Music in 1905. From 1905-1910, René was listed as an “Instructor of Music” at St. Louis University, where he taught piano-forte. He also taught Gregorian Chant at Kenrick Seminary in 1906-8 and 1910-1911. On May 3, 1910, he married Angela Landzettel, who was also an accomplished musician and a published composer. During the nine years René lived in St. Louis, 59 of his compositions for organ and/or piano are known to have been published. In addition to teaching and his work as a church organist, René performed frequent concerts in the St. Louis area, most often as an accompanist, according the concert programs in the family scrapbook. The performances, whether they took place in “Becker Hall” or in other venues, nearly always featured many collaborators: violinists, vocalists, organists, and pianists. He moved to Belleville, Illinois, in 1912 where he was the organist for St. Peter’s Cathedral from 1912-1915. During his tenure, the Estey Organ Company installed op. 1093 in the Cathedral in 1913. While in Belleville, nearly 50 more of his compositions were published. In 1915, the Becker family moved to Alton, Illinois, and remained there until 1930. René continued to teach and compose and was the organist at Sts. Peter and Paul Cathedral, publishing nearly 100 more compositions during those 15 years in Alton. The cathedral organ was an 1893 Hook & Hastings, op. 1569 of two manuals and 27 registers. Sadly, on July 21, 1949, a powerful lightning bolt struck the steeple of the Cathedral and destroyed the organ. In 1930, they moved again and René became the first organist at Blessed Sacrament Cathedral in Detroit, Michigan, remaining there until 1942. The organ at the Cathedral today is still the same as then: Casavant Frères op. 1114 installed in 1925, with three manuals of 61 keys, a 32-note pedal board, and 50 stops. Between 1931 and 1947, only eight more compositions were published (more than 300 works in manuscript, written throughout his entire career, remain unpublished to this day). The Great Depression was not kind to the music publishing industry: many of René’s submissions during those years were rejected by publishers for economic reasons. After 1942, René moved to St. Alphonsus Church in Dearborn, Michigan, where he served as organist until retirement in 1952 at the age of 70. Records of the Austin Organ Company indicate that their instrument at St. Alphonsus was of 30-stops and had been installed in 1929, with three manuals of 61 notes each and a 32 note pedalboard. René’s retirement was caused by complications and suffering from the Parkinson’s disease of which he died on January 28, 1956 at the age of 74. This disc is the world premiere recording of these works of Becker. The pieces chosen here are among the best, most sophisticated, and most varied of his organ compositions. Romantic and dramatic, the Sortie Solennelle, op. 70, opens immediately with virtuosic arpeggio figuration coupled with dramatic chromaticism and extended pedal solos. Though compositionally in Becker’s unique and surprising harmonic language, it also represents a stylistic homage to the virtuosic final movement of Felix Mendelssohn’s first organ sonata, op. 65. It bears a dedication to W. Ray Burroughs of Rochester, New York. Cantilena, op. 42, is a lyrical and tender composition dedicated to Becker’s older brother Lucien, also a prominent organist of the time. Beginning in F major, it modulates to B-flat, followed by contrasting material in G-flat major that skillfully transitions to a return of the opening material in the tonic key. The coda, curiously, modulates to a peaceful ending in G major. The on-going sixteenth notes in the accompanying voice murmur continuously under a dialogue between melodies heard on the soaring Hautbois and Flûte Harmonique. Becker wrote at least 12 toccatas for organ. The exuberant Toccata, op. 45, calls instantly to mind the toccatas of Dubois and Lemmens. It is dedicated to his organ professor in Strasbourg, Adolphe Gessner. The toccata begins in F major, followed by charming chorale-like contrasting material in D-flat that becomes intensely chromatic, leading to the key of B-flat with flourishes of the toccata material interspersed with phrases of the chorale. This transitions to a complete restatement of the opening toccata with the chorale melody returning in the coda. Becker’s three published organ sonatas are arguably his greater and more significant compositions. The latter two represent his weightiest and most refined writing, combining counterpoint with his characteristic long, arching melodic lines. Op. 41, the Second Sonata in F, opens with an extended and grandiose first movement using the full foundations of the organ to lead to a contrasting grand fugue with all of the reeds in the Récit. The work is dedicated to another of his Strasbourg professors, Ernest Münch. The return of the opening theme is amplified by a gradual crescendo to a climactic sequence on full organ, which then recedes rapidly to pianissimo for the final chords on the Récit. The second movement, Pastorale, is an extended and picturesque solo for the Hautbois in D-flat major, contrasted with a delicate dialogue between the Voix humaine and a Bourdon before a return of the entire Hautbois solo. The Finale presents a dark and vigorous theme in F minor which leads to a contrasting chorale-like theme, again in D-flat. This modulates to a soaring transition reminiscent of Charles-Marie Widor, before a restatement of the chorale theme leads to the return of the triumphant F-minor theme. The movement closes with a stately chorale in F major on full organ. Third Sonata in E, op. 43, which is dedicated to Edwin Arthur Kraft, begins with a majestic Prelude in E major that is marked fortissimo for the entire movement. The chordal melody heard throughout is treated with doubled chords in both hands. The second movement, Adoration, is a tender soliloquy in D-flat on the shimmering strings and flutes, with a sweetly descending melody that calls to mind the writing of Widor in the fourth movement of his fifth organ symphony, op. 42. And again like Widor, the following movement is a brilliant Finale: Toccata in E major. Virtuosic writing for the manuals leads to dramatic cadential pedal solos, and the movement ends with a startling sequence of grand chords on the full organ of Église Saint-Salomon et Saint-Grégoire. Supplication, op. 81a, exemplifies Becker’s smaller and more evocative works, using the strings, flues, and celestes of the organ to showcase this tender and petite musical prayer. The massive Marche Triomphale: Ite missa est, is an exultant work in D major, dedicated to a former archbishop of St. Louis. The grand pomp of the festive march can be vividly pictured accompanying the end of a cathedral liturgy for a high festival day. The development of a stately chorale in the contrasting material changes the character of the work before the regal march theme returns to end the work with majesty. “Rene L. Becker: a Biography,” American Organist vol. 1, no. 3 (March 1918), 140-141. Baldwin-Wallace College Bulletin, School of Music, vol. 4, no. 4, Sept. 1916, in Becker family collection. Becker, Edouard (“Life of Edouard Becker,” written in 1883), “La Famille Becker,” musimem.com/ becker, accessed 20 June 2010. Becker, René Louis, Baker’s Biographical Dictionary of Musicians, 4th Ed., NY, G. Schirmer, Inc., 1940, 76. Becker, René Louis, The International Cyclopedia of Music and Musicians, Oscar Thompson, ed., NY, Dodd, Mead, 1939. Becker, René Louis, International Who’s Who in Music and Music Gazetteer, César Saerchinger, ed., NY, Current Literature Publishing Co., 1918. Catalog: “Becker Bros. Conservatory of Music,” St. Louis, Skaer Printing Co., 1905, family collection. Julius Becker, in interviews by author, Birmingham, MI, 14 Aug 2009 and 13 May 2010, and examination of family collection. Angela Landzettel musical compositions, provided by Julius Becker, 13 May 2010. Ss. Peter and Paul Church, Compunet Web Design Services, ssppalton.com, accessed 28 June 2010. Cathedral of the Blessed Sacrament, OHS Pipe Organ Database, organsociety.org, accessed 11 Nov 2010, ©2005 Organ Historical Society. Contract between Austin Organ Company and St. Alphonsus Church, Dearborn, MI, provided with stoplist by the Austin firm, 2010. The first stone of the Church of Saint-­Salo­mon-­Saint-Gregoire is believed to have been laid in 1080, and the chancel of the early building remains. The earliest known organ was purchased from Jean Moutton in 1623 and was “a pair of 4' organs, of decent height and size,” relates Fr. R. Moufflet, abbott, in his 1947 book, Petite Histoire de Pithiviers. A century and a half later, in 1784, Fr. François Regnard ordered and received a new 8' organ of 15 stops on one manual from the Orléans organ­builder Jean-­Baptiste Isnard (nephew of the more famous organbuilder Jean-Esprit Isnard). Two years later, in 1786, Fr. Regnard ordered from Isnard a significant enlargement of the organ to include 16’ pipes contained in flanking additions to the 1784 case, resulting in an organ of 42 stops played by four manuals and pedal. The manuals were traditionally configured: full-compass Positif and Grand Orgue, and half-compass Récit and Écho. The newly enlarged organ and a newly built loft containing it were dedicated in 1789. A century later, Msgr. Chabot, the parish priest in 1889, received Félix Reinburg from the Parisian firm of Aristide Cavaillé-Coll. Reinburg found the Isnard organ intact but in poor condition, and proposed rebuilding it to the tastes of the day using most of the existing pipes, adding several string stops, omitting tierces, the Larigot, and some mixture ranks, to render an organ of 45 stops on three full-compass manuals and pedal, with modern accessories such as the expression pedal, Barker lever, couplers, and registration aids. The proposal was accepted, and Alexandre Guilmant dedicated the rebuilt organ on June 23, 1890. The organ would exist for 70 years as rebuilt by Cavaillé-Coll. In 1960, Robert Boisseau of Poitiers began another restoration. At that time, the organ included 24 stops of Isnard pipes and three more early sets of pipes, perhaps added in the Cavaillé-Coll rebuild. Boisseau extended the manual compass from 54 to 56 keys, the pedal from 27 notes to 30, and added stops to bring the total to 49. He recreated the missing 18th-century ranks: tierces, Larigot, and Quarte de nazard, recreated the 16’ plenum (plein-jeu) comprised of 14 ranks in the Grand Orgue and Positif based largely on Dom Bédos’ descriptions of the Plein-Jeu and the mixture breaks used by F. H. Clicquot at Souvigny, moved the IV Cymbale of the Récit to a slightly higher pitch to render a brighter 18-rank plein-jeu when desired, closed and soldered tuning scrolls added by Cavaillé-­Coll, rescaled pipes and lowered wind pressure to 18th-century norms, removed nicking and revoiced. However, most of the Cavaillé-­Coll Récit was retained as was the 1890 mechanism, eschewing recreation of an 18th-­century, suspended key action. In 2005-2008, Bertrand Cattiaux restored and renovated the instrument, which is classified as an “Historic Monument.” This disc marks the first recording on this organt since the renovations were completed in 2008. Hailed as “elegantly assured” by the Dallas Morning News and featured on the nationally broadcast Pipedreams radio program, Damin Spritzer performs organ recitals from coast to coast, and has played and spoken for conventions of the American Guild of Organists. Her varied programs often champion unknown romantic works for organ as well as recent compositions by living composers. Her research on the life and music of René Louis Becker is in preparation for her doctoral dissertation at the University of North Texas. She received her Master of Music degree in Organ Performance from the Eastman School of Music and her Bachelor of Music degree in Organ Performance from the Oberlin Conservatory of Music. She has competed and won awards in many organ competitions, and was selected as one of the initial 25 competitors in the National Young Artists Competition in Organ Performance in 2006. She has received both First and Second prizes in AGO Chapter and Regional Competitions in Portland, Oregon and Cleveland, Ohio, was a Finalist in the National Competition for Young Organists in Ottumwa, Iowa, and was selected for the Honorable Mention for Repertoire Playing and the prize for Best Hymn Playing in the graduate division of the 32nd Annual William C. Hall Pipe Organ Competition in San Antonio, Texas. A native of the Pacific Northwest (Vancouver, Washington and Portland, Oregon), she studied piano with Carol Crawford and Harold Gray, violin with Pierre d’Archambeau and Raphael Spiro, and organ with Delbert Saman. Her subsequent organ instructors include Jesse Eschbach, David Higgs, Haskell Thomson, David Boe, Gerre Hancock, Joel Martinson, and Karel Paukert. Ms. Spritzer is Associate Director of Music and Organist for University Park United Methodist Church in Dallas, Texas. She held the similar post at Saint Rita Catholic Community in Dallas from 2000-2008, and prior to that served at Peachtree Presbyterian in Atlanta, Georgia from 1999-2000. In Dallas, she has served multiple times on the Executive Committee of the Dallas Chapter of the American Guild of Organists. Reviews Classical Music Sentinel, Jean-Yves Duperron, June 2011. Step aside Léon Boëllmann, move over Charles-Marie Widor, and let René Louis Becker show you how it's done. I can't believe organ music this good has been neglected or ignored by the recording industry for this long. This CD represents the world première recording of these pieces by René Louis Becker (1882-1956). An Alsatian-American composer who was born in France, then moved to the United States in 1904 where he worked as an organist for the rest of his life.. . . This is colorful music, ripe with melodic invention, rich with harmonic confidence, and an effortless flair for thematic development that could put better known composers to shame. The reason why I picked Boëllmann and Widor for comparison, is precisely because some of Becker's music very much resembles their style. The Cantilena for example, brings to mind the Prière à Notre-Dame by Boëllmann, while the Toccata has just as much forward momentum as the one made famous by Widor. The slower and more lyrical segments of his pieces are always adorned with beautifully shaped melodies made to highlight the sweeter flute and oboe stops of the organ, while the more upbeat works will make you want to get up and walk a victory march. Unlike many other heavy-handed organists, Damin Spritzer drives the music along with plenty of forward momentum which adds a singing quality to the melodic lines and an assured rhythmic movement to the toccatas and marches. Her constant search for unknown works for organ and championing of new works by living composers, have brought much respect and many awards her way. The instrument she chose for this recording is the Organ of the Church of Saint-Salomon- Saint-Grégoire in Pithiviers, France. It's a combination 1789 Isnard and 1890 Cavaillé-Coll, revised in 1960 by Robert Boisseau and fully restored in 2008 by Bertrand Cattiaux. In fact, this recording is the first one since the restoration. It's a very well balanced instrument with a range of stops from a 2' Doublette to a 32' Soubasse, and everything in between including some impressive Trumpet and Bombarde stops. Believe me, the final glorious chord of the Marche Triomphale will make you glad you're alive.